By Jana Bryan Wunderle, JMMDS. This is Part Two of a two-part blog. Please see original post here. Designing Little Falls Park has been a pleasure. The Visioning Workshop, as described in Part One of this post, provided the big ideas needed to imagine the possibilities and understand what is needed. 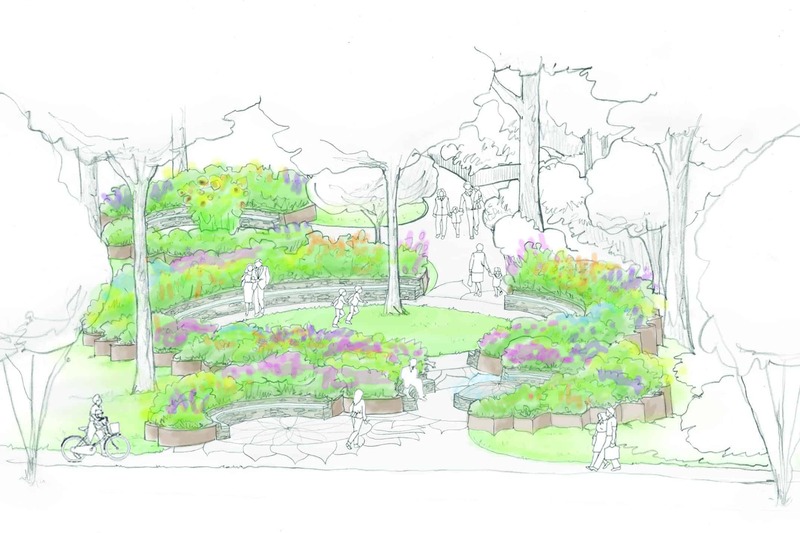 The design for Little Falls Park aims to maintain the character of the site, while also providing an inspirational place to explore plants (both native and cultivated), share the love of gardens, and encourage the connection to downtown. Two sketches generated at our Visioning Workshop display the thoughtful ideas discussed. Images: JMMDS. The initial Sunflower theme (left) remained throughout the development of the design (right). Images: JMMDS. 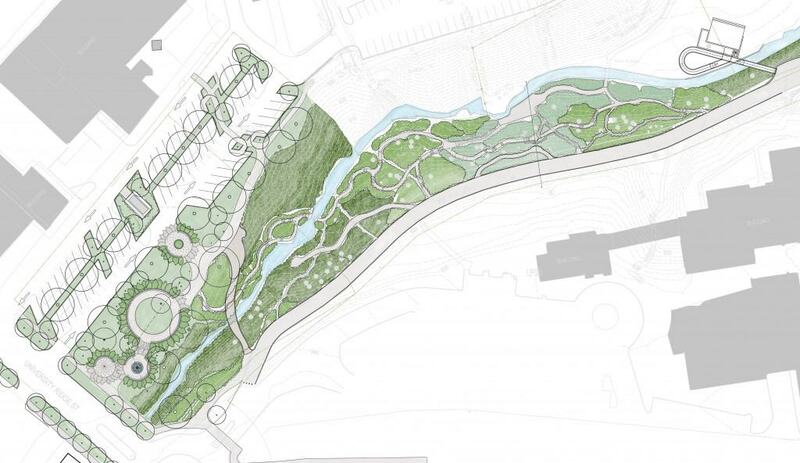 The final schematic design of Little Falls Park. Image: JMMDS. The site is composed of two distinctly different areas that sit adjacent to each other. 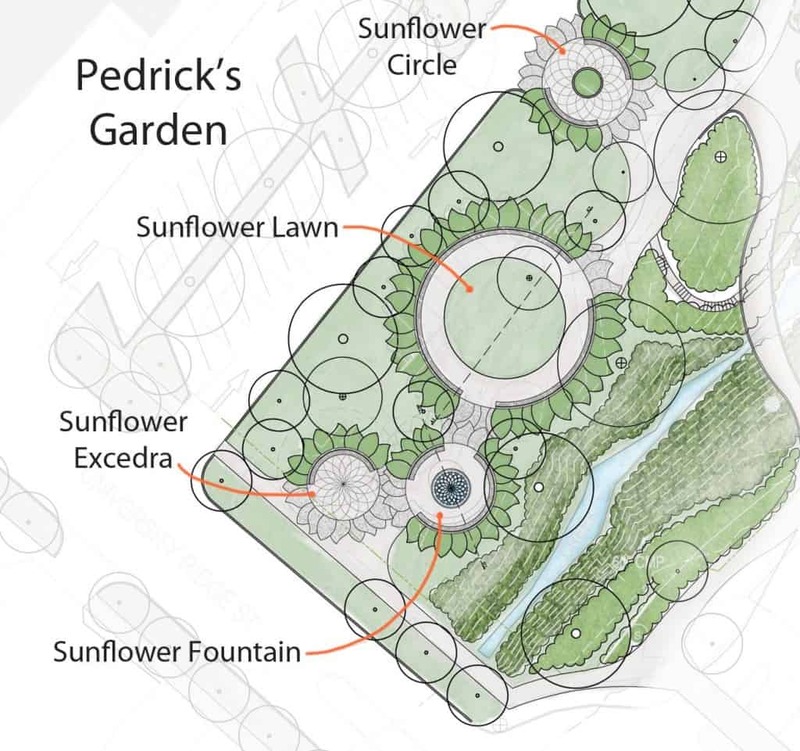 At the top of the hill, next to a parking lot that sits behind a major shopping street, Pedrick’s Garden is designed as a series of linked spaces, each of which is in the form of a sunflower, the symbol of hope for Pedrick and her family during her illness. Weathered steel planters in the playful shape of giant petals serve as raised planting beds. Visitors can move through the centers of the four sunflower spaces, each of which has a different size and focus. The enlargement plan of Pedrick’s Garden shows the different connecting sunflower spaces. Image: JMMDS. The Sunflower Excedra is a meeting place along the public sidewalk. Its pattern underfoot suggests a sunflower’s center. In the next garden, the sunflower’s characteristic double spiral pattern takes form as the Sunflower Fountain, to be built in intertwining cast bronze runnels down a dome. A soft mist of fine spray jets designed to cool the air during Greenville’s humid summers encircles its base. The Sunflower Lawn is the largest of the series, offering visitors a place to picnic or play. Around the large circular lawn is a stone bench that is characteristic of Falls Park, giving passersby a place to sit amongst the giant petals filled with colorful plantings. A smaller entry from the parking lot to the park is called the Sunflower Circle, where the center of the space will include signage and more colorful plantings. The pattern of the sunflower’s center (left) is transformed into a gentle water feature (right). Sunflower image: Randomnies. Fountain sketch: JMMDS. This axonometric view of Pedrick’s Garden highlights the gardens in the weathered steel petal-shaped planters. Image: JMMDS. To get to the Carolina Foothills Garden Club Arboretum that rests in the ravine below, a visitor can either follow a stone path down the hillside from the Overleaf, the leaf-shaped gathering space that overlooks the garden, or cross the Botanical Bridge. Its organic shape transitions well between the offset circles that compose Pedrick’s Garden and the more natural site that rests below the high canopy of old beeches, tulip poplars and willow oaks. When built, it will connect an outer parking area with downtown shops and restaurants. 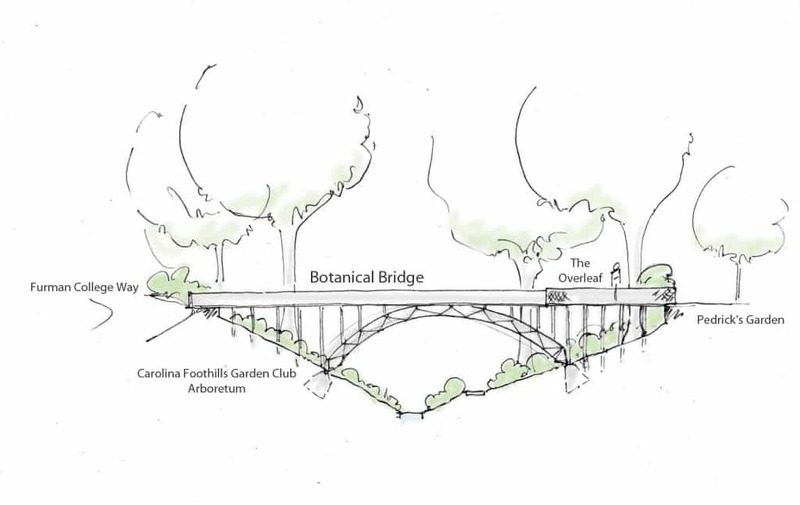 The Botanical Bridge will provide a view over the arboretum and a connection across the site. Image: JMMDS. The Carolina Foothills Garden Club Arboretum will be composed of a series of paths through the narrow and steep ravine through which the Reedy Creek runs. At the top of the slope will be an accessible boardwalk. Further down the slope, old mortared stone paths will be restored and new ones created to bring visitors to the major focal points in the garden, including the Spring House. Running throughout will be narrower footpaths that enable explorations of the native and ornamental flora. A few mortared stone benches will be placed to match the existing one that was originally created in 1930. Restoration and new construction will be needed in the arboretum, as shown in this enlargement plan (left). A sketch overlay of the Spring House Gathering Area (right) describes the character of the space. Images: JMMDS. Furman College Way was once a highly used road for park-goers and joggers alike. Closing the road for emergency vehicles and city staff will allow it to become safer for pedestrians and strengthen the connection to the outer parking areas. L: Art may be included in the garden as temporary, juried exhibits. Photo: Blue Bird sculpture by Lorna Green. Right: Simple construction methods that are light on the land will allow everyone to enjoy the inherent beauty of the place. Boardwalk photo: Tamia Nelson’s Outside. The Mill Run Performance Stage will improve the summer theater space that now exists in Falls Park, with a better orientation, easier access and lockable storage. Mimicking the form of an old mill ruin will add a hint of history and create an interesting garden terminus for Little Falls Park. 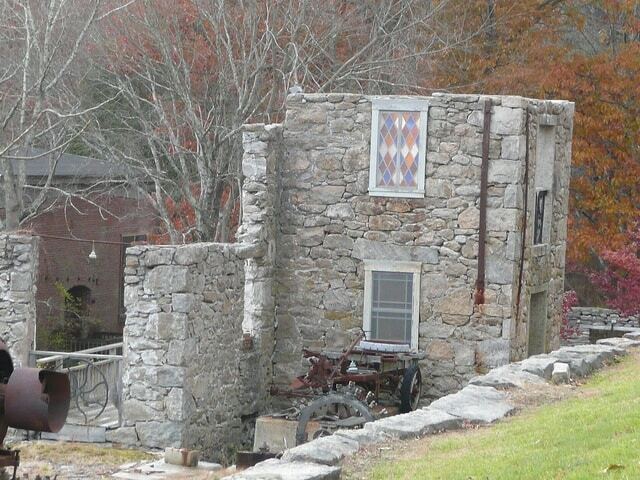 This image of an old mill ruin serves as inspiration as the design of the performance stage continues. Photo: Carolina Mill Ruins. What’s next? Pedrick’s family, Carolina Foothills Garden Club, Greenville’s Department of Parks & Recreation, and JMMDS are all excited to see the design develop …and to walk through this inspired landscape one day soon. Wow, what a great design. Love the axon view, a very intimate space. So excited about this new design, particularly Pedrick’s Garden! I had the privilege years ago of meeting Pedrick at a garden design workshop Julie did at Kanuga. She was such a beautiful and inspiring person, and what a tribute to her life for Greenville City to honor the family with a garden in her name. I can’t wait to make a visit to Greenville and the park when it is complete! Thanks for asking. Our blog and website are based on the Filterd theme from Themepress. Good luck with your blog.